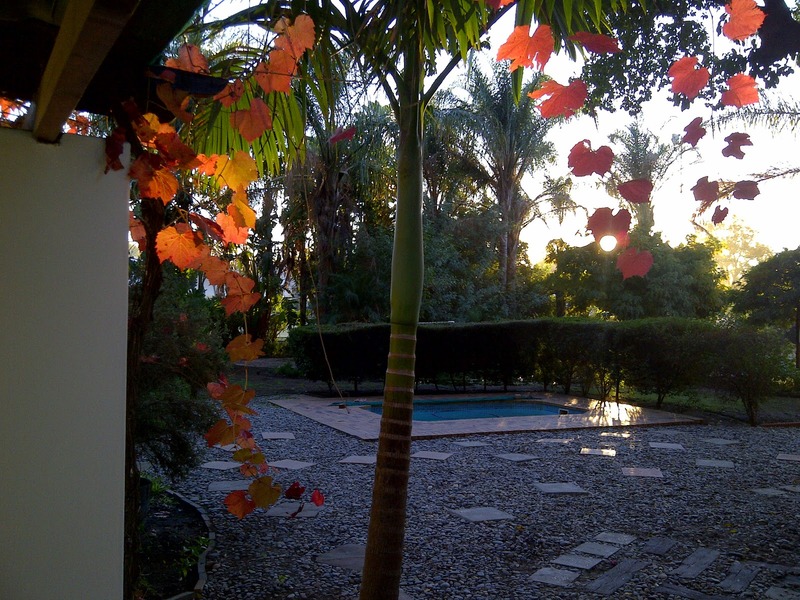 Most animals around here don't see Saint du Barrys as a four star guest house. It's just a place in their space. 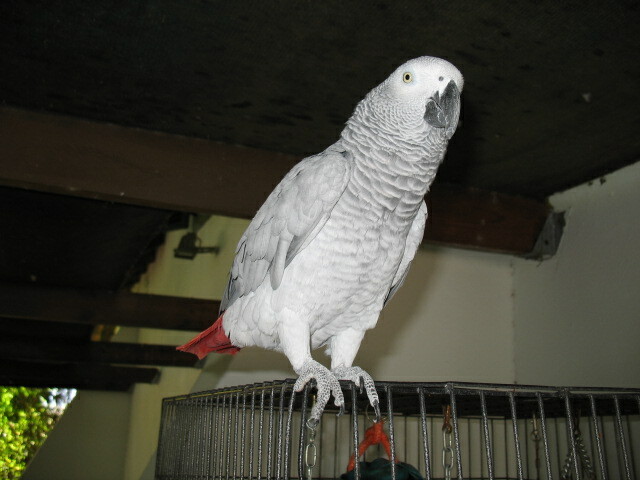 The birds: Ramius the Red October is our African Grey, and this is the one guests will see and hear. He's about thirteen years old, and loves sorting things out. His first words, untaught, were "Sort out your life!" shouted out from the top of the cage. The conversation stopped for a long, amazed moment. He is part of our lives and part of Saint du Barrys. He firmly believes that guests arrive to chat and entertain him. Then the two love birds. We started off with two, one male, one female, and one day while Joan was watching, a hawk swooped suddenly and grabbed the male. We found him later, hardly a feather out of place. He must have died of a heart attack. So we got another male who made himself at home quickly. They fly freely in and out of the cage, and have made a nest behind an air conditioner. They come to the cage to eat, and they're high velocity birds. They take off and land at the cage at about chin height, at a speed of about thirty kilometers per hour. No-one has yet been hit, but there's always a first time. We have hanging bird feeders in the front garden and a large standing bird feeder in our own garden. There's another feeder behind the kitchen, and we now know that birds are not exempt from social class. There are distinct differences relating to shrillness, roughness and rowdiness between front and back of house bird behaviour. They don't all come to the feeders, especially not the big ones, but you'll see finches, sparrows, pigeons, canaries, kingfishers, butcher-birds, hoopoes, hadedas (these you'll hear more often than see), Egyptian geese, and when conditions are right, there are martial eagles. We had a family of three two years ago, but we haven't seen them for a while. They come on hot, still mornings, using the air-currents to glide down from the mountains. We had fish, gold and red in colour, and a huge grey one called Khoisan, who flourished and multiplied to many and then very many, in our pond, along with crabs and frogs. But the municipality went on an eco-rampage and hacked down trees along the Jan Dissels river which is meters away from us, and left the logs to disturb the flow and disrupt patterns of living. Along came an otter, night after night until the fish were all gone. Well, as the man said, in Jurassic Park, "Life always finds a way...". Whatever living thing has come along our way, and gone, is absorbed into the memory of Saint du Barrys. It's a remarkable experience. 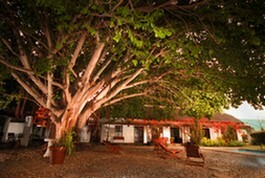 The huge fig tree itself is a presence. We experience the seasons more closely and vivdly than we would in the city. We appreciate guests who take a moment to taste the unqiue atmosphere that this place breathes, that we hope we have nurtured and grown. Although our visiting otter seems to be removed from the affectionate Ring of Bright Water fellow-otters, and has left memories of trashing the pond and eating its inhabitants, we can't take umbrage at this occurence: it's part of the circle of which we, too, are part. New season, new blog, new direction. We've given our website a new image (thanks Johann) and we don't think winter is quite over, but the sunny days are promising spring, flowers and plenty of energy at Saint du Barrys. On the way back from Cape Town and Vredendal we saw the beginning of flowers along the side of the road between Clanwilliam and Klawer: between Clanwilliam and Citrusdal the flowers spread up the hill into the fields. This year's rain has been more soft than hard, more nurturing than stormy. Perhaps spring will reflect this. We hope that all our guests, new ones, those who return regularly, and all who are interested in the Cederberg region and its towns will make this blog a regular read. Your comments and feedback will be appreciated. We're completing the re-thatching: take a look at facebook (we've set up a new presence there, too - thanks, Johann...), and we've upgraded bathrooms, so we're ready for another season. We're expecting Kohin-Acts, a Christian outreach group to stay over while they're in town this week. Since the beginning of the year we've had a new gardener, Sydney, who has made a huge difference to many facets of Saint du Barrys. He has gardened, painted, learned to iron - even those sheets with the fitted corners! Thanks Sydney! And Mandy , our housekeeper, is getting married this year. Perhaps some guests will be in time to see the end of the reception in the garden. Please visit Saint du Barrys blog again: we'll be adding regularly. As I write this, the sky is clear and blue, the Cederberg range sharp and deep, with many shades of green and blue, the temperature somewhere in the mid-teens C, and a light aircraft is droning high up. The view from there must be magnificent.